Charlotte continued to travel to New York on business throughout the 40’s and early 50’s. It was in the early 50’s that she had an art show at a local bank in Wallingford, Connecticut. Here she met my father, Arthur Koch. He also was a graduate of Yale, (1920) and spent many years teaching at Choate School. At first, it was a meeting of the minds, and later of the hearts. They were married in 1953. In 1952, she did a commissioned portrait of Mrs. John Lodge, wife of the Connecticut Governor John Davis Lodge. This won first prize at the local Meriden Arts and Crafts show. Her hometown would eventually honor her with a spot in Meriden’s Hall of Fame. Early in their marriage, my father had done some work as an artist’s agent, for my mother and a few other artists. He had previously been director of American Artists Galleries. He formed a business association with one Andrew Baldwin, and later Mr. Baldwin commissioned Charlotte to paint a portrait of President Dwight D. Eisenhower in 1960. 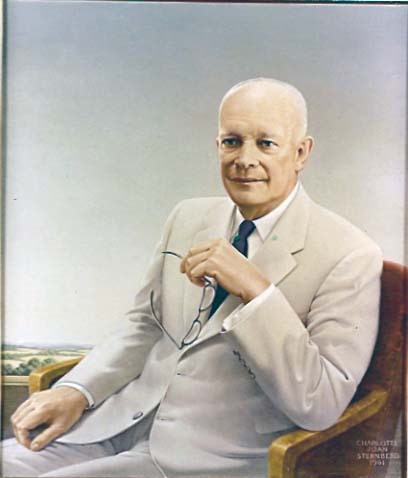 The portrait of President Eisenhower. At the time, Eisenhower had recently left the presidency, and Arthur and Charlotte traveled to Gettysburg, Pennsylvania to meet him at his office. Charlotte was astonished at the Civil War cemetery there, with a shocking number of graves throughout the woodlands. Eisenhower was formerly a famous general in World War Two, and commander of the Normandy invasion, which brought American forces ashore in France to fight the Nazi occupiers. When he met Charlotte, he took her all around his office, showing her pictures of the invasion and telling her all about it. She later confessed that she was so impressed that she hardly remembered much of their conversation! She spent a morning there, sketching and photographing him, and made a portrait showing his characteristic gesture of holding his glasses in one hand. The toughest part of this painting was the President’s suit: it took hundreds of strokes to make the smooth-textured fabric blend! This portrait is now in Eisenhower’s hometown of Abilene, Kansas, at the Eisenhower Library. During the 1950’s, Charlotte had largely stopped working in New York, and eventually Arthur did, too. She kept on doing the Christmas cards, sending several paintings a year to American Artists Group. 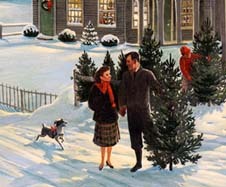 As time went on, she expanded the range of these cards, painting many different Christmas trees, cupboards, and an enormous variety of snow scenes. My parents and their fox terrier, in General Store. She also did many portraits of me, thirteen in all. 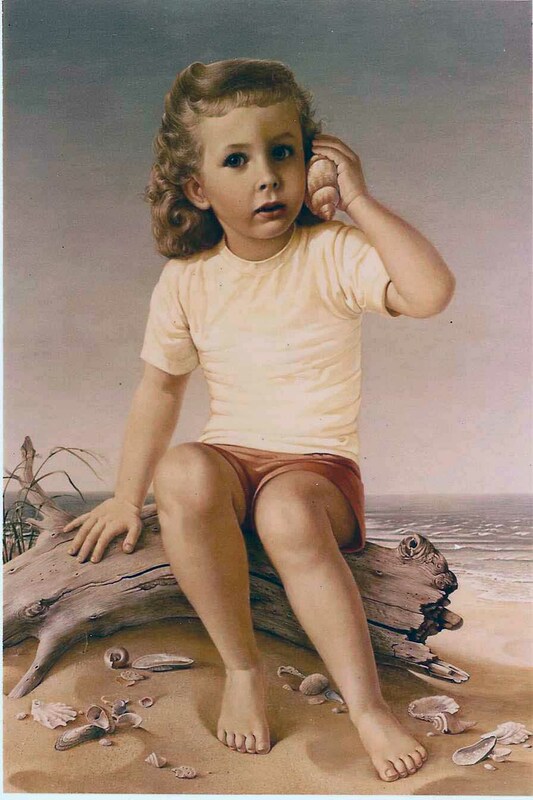 My portrait, at five years old. The driftwood was based on a tiny piece that Charlotte found on a local beach. They showed her dreams for my future: expanded imagination, new discoveries, great wonder and new life. She also did ambitious landscapes, eventually executing several that were two by four feet. 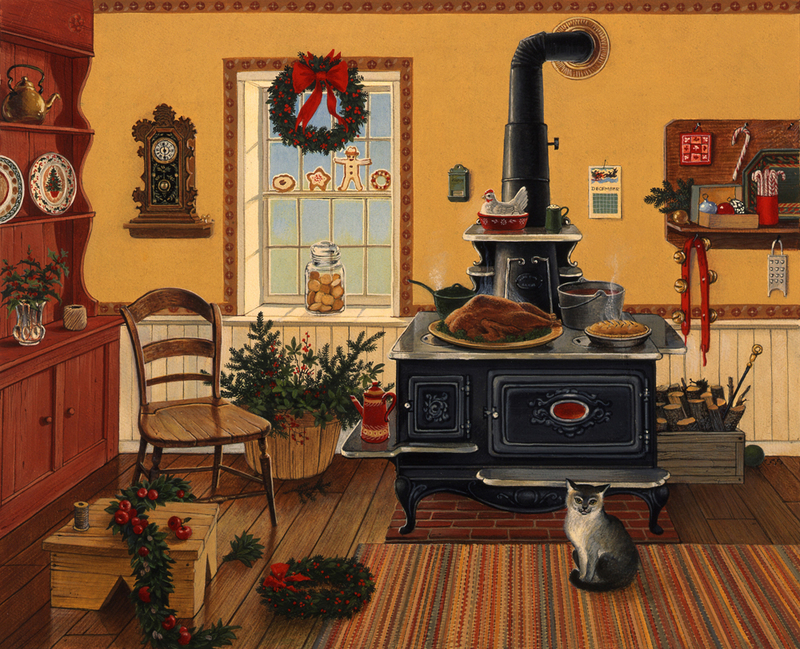 Many paintings also had family themes: my grandfather’s tool bench, a self-portrait on James Monroe’s porch, or a still life of my great-grandmother’s kitchenware. Many of the card designs contained little references to our family. The family appeared in some paintings. 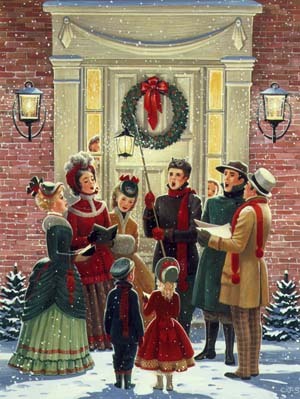 Another card design showing carolers was inspired by a spontaneous carol sing that occurred in our old neighborhood. Here are some of Charlotte’s carolers. This is my grandmother’s Glenwood range, and she was a trained cook, as well!